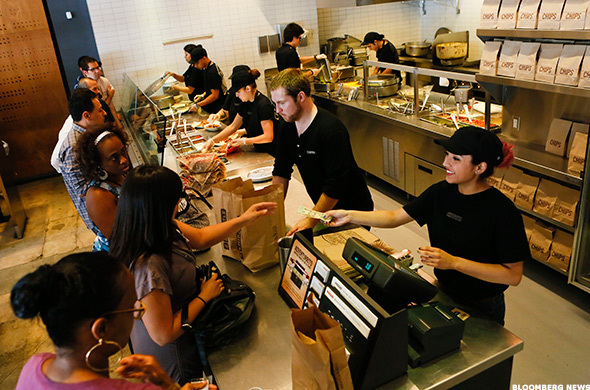 Chipotle has become a phenomenon among consumers and Wall Street. Co-CEO Monty Moran tells TheStreet what the company is cooking up. NEW YORK (TheStreet) -- Chipotle (CMG - Get Report) , led by co-CEOs Monty Moran and Steve Ells, is something of a phenomenon in the American dining industry. Pictures of enormous Chipotle burritos light up Twitter feeds across the country almost around the clock, while Vine videos showing long lunch lines at newly opened locations flood Facebook. The company also has become a phenomenon on Wall Street for its aggressive number of annual new restaurant openings and robust sales growth from pre-existing sites. But staying in the good graces of hungry consumers and Wall Street won't be easy tasks for Chipotle as copycats of its successful business model sprout and investors demand ever-higher profits. To ensure there are no disappointments, Chipotle is staying true to what has made it so successful: It remains focused on the guest experience and responsibly raised ingredients that are making folks question the origin of traditional fast food, and the necessity to eat it. The attention to the smallest of details continues to pay dividends for the company. Chipotle's five-year compound annual growth rate (CAGR) in revenue is 19.27% compared to an industry average of 5.49%, according to Bloomberg. Gross profit margins in 2013 of 66.6% far surpassed Starbucks' (SBUX - Get Report) 57.1% and McDonald's (MCD - Get Report) 56%. More recently, Chipotle's same-restaurant sales have accelerated for three-consecutive quarters, notching a 17% increase in the second quarter. By comparison, the domestic business of Starbucks recorded a second-quarter same-restaurant sales gain of 6%, McDonald's a 1.5% decline for its U.S. division. Chipotle's Moran talked exclusively with TheStreet about how the company is preserving its unique employee culture, one that is grounded in promoting from within through its restaurateur program, as the chain grows both with its namesake and with new concepts. Moran also addressed how the company's business model is upending the traditional fast food industry. Brian Sozzi: How are you implementing what has worked so well with Chipotle's culture into your newer concepts ShopHouse and Pizzeria Locale? Moran: Our vision is that any concept we are involved with will benefit from our unique people culture. We think that the people culture and food culture, as well as the unit economic model, are what yields the extraordinary success that we've had, and are keys to any concept going forward. 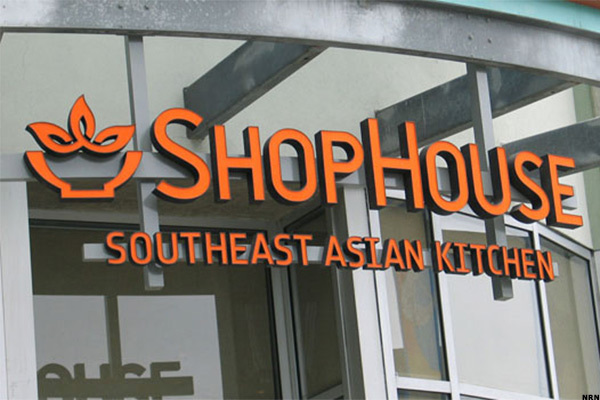 With ShopHouse, there are already a couple of restaurants that have become restaurateur restaurants. In fact, there are four that have become restaurateurs already out of seven total restaurants. They have bought into the people culture. With Pizzeria Locale, it's also their intent to operate their restaurants with a unique culture. Sozzi: And at the still new international locations? Moran: It's going really well. It's too early for me to tell in Germany, as I haven't gone to the German restaurant since it has been opened. But from what I understand the team is very dedicated and the restaurant runs well. I have spent a fair amount of time in the restaurants in France, and a whole bunch of time in the restaurants in London. We have had some restaurateurs that have left the U.S. to go to work in England and France who have done a marvelous job of putting in place that people culture. In the U.K., we have four out of six total restaurants that are now restaurateur restaurants. Sozzi: Are you concerned about culture preservation as the company grows even larger? Moran: The name of the game to making sure the culture works, and is sustainable, is making sure that we have enough restaurateurs being developed. Then, we have to make sure enough restaurateurs are rising up into positions of leadership in the company. We are pleased to see that a lot of this is happening. Sozzi: Have you and the team noticed over the past year or so even more qualified applicants seeking to join the Chipotle team? Moran: Yes, I think the average quality of applicant that comes into a crew position today is vastly superior to what it was five, six, seven years ago. People come to us because they have heard of us now, not just as a concept, but also as a people-oriented culture. They come because they have heard of the opportunities, and we have a lot more applicants than we used to, and we are able to be a lot pickier. I think we are also better at picking for positions in the restaurant. We really take a long view of everyone that gets hired at Chipotle. The more people see their peers moving up, the more the word of mouth carries out, the more people recommend us to their friends. And because the opportunities are so significant to move up, we get people that are willing to take, I would say, significant demotions in terms of position. For example, being a crew member at Chipotle, so they can move up and become restaurateurs. Sozzi: Could you take us through where new technology has begun to appear inside the restaurants? Moran: In terms of mobile and online ordering, years ago we rolled out an application for your iPhone and then Android very recently rolled that out. The reason we worked through these was really to provide convenience to some of our customers that are pretty tech savvy. We didn't want to be low tech and then disappoint their desire to have that way of ordering Chipotle. Of course, we have the online ordering system now by which, between phones and online, is 4% of our business today. It's a significant amount of business. Sozzi: What are you doing right now operationally to take Chipotle's best-in-class line speed up another gear? Moran: From an equipment standpoint, having these great new tortilla presses that we basically designed and invented some years ago, and which now are in most of our restaurants, that heat the tortilla more quickly and evenly so it's easier for our crews; the change machines we rolled out some years ago. But the No. 1 thing that helps throughput is our focus, a couple of years ago we started with our four pillars of throughput. We have found that even if there are 100 things you could do to improve the throughout, 90% of the benefit you'll get is contained within these four pillars, which are very specific things we teach each person in our restaurant to do. Two of them are actually positions in the restaurant, an expeditor, which is the person standing between the person that rolls the burrito and the person who serves it, and who makes sure to put it in the bag to go, get you a drink if you need one, or chips and guacamole if you wish to have that. So, the cashier doesn't have to trouble themselves with that. The other is a linebacker who walks behind the line and makes sure the food is full, and the frontline and kitchen are humming, all the spoons and pans are in place, and the line is clean. The other two are mise en place, French for "everything in its place." Before service starts we want to make sure that absolutely everything is ready to go so people don't have to leave the line during peak hours to go do something that should have been done before. And finally, the other is what we call "aces in their places," meaning having the person that is very skilled at each position in that position at peak hours, and not having them training someone that may not be as skilled. Sozzi: Do you compensate those restaurants knocking the cover off the ball in terms of throughput? Moran: We don't necessarily have financial incentives, occasionally we run throughput contests to see how much various restaurants can increase their throughput speed. The real incentive is when we rate field leaders at the end of the year, the No. 1 thing we rate them on is developing great teams and then, how well they are adhering to the four pillars of throughput. When they have great teams, they distinguish themselves very, very quickly as one of our very powerful leaders. Given how badly we need leadership in our organization, they become the big leaders. They are the ones who get the promotions, become team directors, and ultimately executive team directors. Sozzi: With the success of Chipotle inspiring the next generation of fast casual restaurants, I am curious what you are seeing in the market right now. 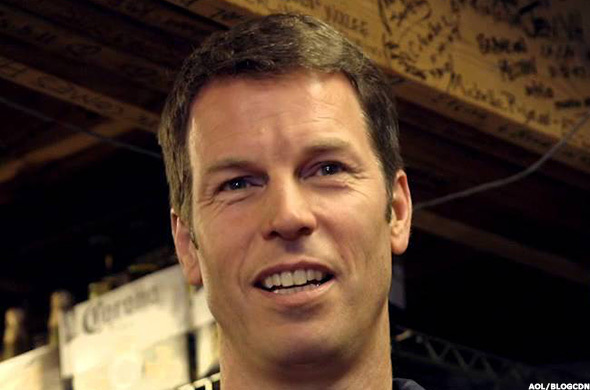 Moran: Certainly I get a lot of emails about people knocking us off directly or who are starting the Mediterranean version of Chipotle, or the pizza version of Chipotle, there a lot of players in that space. I wouldn't say we are insular. But we really appreciate anyone doing food well, and we visit fine-dining restaurants to see what they are doing with food. What we are doing is pretty unique though because of the scale. When you have 1,700 restaurants you have to find a way to sustainably build more restaurants, especially when you own them all like we do, none are franchised, you have to find a way to keep them all running well. We are really encouraged by how many other restaurants are trying to do something with responsibly raised ingredients, or organics, or local products, or whole ingredient. We are very encouraged by that because we think that the more that folks get into making food that actually matters and is better for you, the more traditional fast food becomes irrelevant and starts to fade away. Our mission is to change how people eat fast food. In order to do that, there are a few ways. Build more Chipotles. That is one way. No. 2 is to get into different types of cuisine, as with ShopHouse and Pizzeria Locale. But another way you change fast food is by causing customers to understand how irrelevant traditional fast food is, by traditional fast food I mean where the predominant goal is the cheapening of the raw ingredients, the automation of the work such that anyone could do it that you don't need training so that they turn over their employees without any care for them, where it's a game of value meals and cheapening and cheapening the food experience. That is traditional fast food, and we think that's going away. We, and others like us, will replace that. Another way is that others copy you. The fourth way is you get suppliers to start thinking how they raise food differently because there are more folks like Chipotle, they will have to do things according to our protocols. A fifth way is changing customer perception so that customers are aware where their food comes from and start making demands of grocers and restaurants to provide food in a way that makes sense to them. A sixth way, just educating folks who may not care because they don't know, but once they know may care.